Famous all over the world for the exotic beaches, Lefkada island is a fabulous place to visit for summer vacations. This island of the Ionian Sea, geographically located west of the Greek mainland, has the most amazing sea color. Beaches, like Porto Katsiki, Kathisma and Egremni, are among the most photographed places in Greece. Lefkada also has lovely seaside villages, like Sivota, Agios Nikitas and Vassiliki. In particular, the eastern side has family seaside villages, while the western side is dotted with wild beaches. Have a look in our Lefkada travel guide and find all information for your holidays. Have a look on our travel guide that we have prepared for Lefkada island and see the most important beaches, villages, museums and sights to visit. Also check our lovely photos, 360 pictures and detailed maps to get a better understanding of the location. Check our travel services and organize better your holidays in Lefkada. See the hotels we suggest, book a car rental or arrange your transfer. If you do not want to get into all these details, ask us to organize your holidays. Book your hotel in Lefkada. Various types of accommodation proposed. Rent a yacht and combine your sail to Lefkada with other destinations. Find out useful information on how to organize your travel to Lefkada. 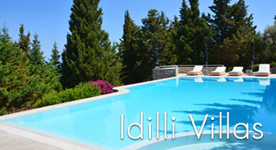 Hotels in Lefkada are spread all around the coasts of the island. On the eastern side, Nydri, Nikiana, Ligia, Sivota and Vassiliki have many accommodation options for your Lefkada holidays. Most accommodations are traditional places with self-catering apartments, but there are also luxurious resorts with pools, jacuzzi, gym and spa treatments. On the western side, many studios and apartments are found in Agios Nikitas, Kathisma, Agios Ioannis and Tsoukalades. The highlight on Lefkada island, part of the Ionian islands, is the exotic blue color of its beaches. Porto Katsiki, Egremni, Kathisma, Tsoukalades, Agios Nikitas and generally all the beaches on the western coast of Lefkada are just paradises on earth. However, the villages are also nice, with traditional style, green surroundings and restaurants with local dishes. Among the most popular sights to visit in your Lefkada holidays are the waterfalls of Nidri and the Monastery of Panagia Faneromeni, on a hill above the Town. Most spots in Lefkada Greece offer gorgeous view to the Ionian Sea and the mainland of the country. This Lefkada travel guide offers all useful information that you need to know for your trip there. Holidays in Lefkada can be combined with other Greek islands, such as Corfu and Kefalonia. Famous for its exotic waters and the wild landscape, Porto Katsiki is the most impressive beach in Lefkada. It is found on the southern side of the island. Located on the western side, Egremni is an impressive coast with light blue waters and sandy shore. Its name actually means cliffs and it is among the most famous beaches on the island. The long and beautiful beach of Kathisma is found on the western side of the island. It has sandy shore, exotic blue waters and part of the beach is organized. Due to the strong winds that blow in summer, Lefkada is a great island for windsurfing and kite surfing. The best windsurfing beaches on the island are Agios Ioannis and Vassiliki. Agios Nikitas is a picturesque village on the western side of Lefkada. The small beach in front of the village has exotic waters, while boat trips to secluded beaches depart from its port. Sivota is a cozy seaside village located on the southern side of the island. It is surrounded by lush greenery and the waterfront is lined up with cafeterias and fish taverns. In a short drive from Nydri, there is a region with great natural beauty. The waterfalls of Nydri are accessed through a short hike among green trees. At the entrance of the Town, there is a strong Medieval Castle surrounded by the waters of a sea lake. This is the Castle of Santa Maura, constructed by the Venetians.